Fr. Barnabas welcomes His Grace Bishop David of the OCA Diocese of Sitka and Alaska to discuss the Orthodox view of the second coming of Christ. What do the Orthodox believe? Divine Liturgy on Sunday, December 14, 2014 at Christ the Savior Orthodox Church (OCA) in Chicago. The priest is Fr. John Baker. As a Christmas gift to our listeners, the Institute for Orthodox Christian Studies (IOCS) presents a reading of "A Homily on the Nativity" from the book Harp of the Spirit: Poems of St. Ephrem the Syrian, translated by Sebastian Brock and published by IOCS. When Jesus heals a woman on the Sabbath Day, His act of love and mercy reveals the deep spiritual poverty of others whose hearts are gripped by mere rule-keeping. On a new "Faith Encouraged," Fr. Barnabas Powell explains how this revelation is an invitation to you and me to examine our own attitudes towards our faith! When Jesus came as the Gift to the world as a stranger, He encountered politics, and it was politics that ultimately killed the Gift. On this encore presentation of "Steve the Builder," Steve Robinson remembers the time in Houston, Texas, when politics once again killed the Gift of Christmas. Is Orthodoxy really somehow immune to the liberalism and worldiness that afflicts everyone else in North America? On a new "Ancient Faith Commentaries," Fr. Lawrence Farley, pastor of Saint Herman of Alaska Orthodox Church in Langley, B.C., argues, "No!" On this episode of Orthodoxy Live, Fr. Evan addresses questions from listeners on fasting, speaking in tongues, and more. 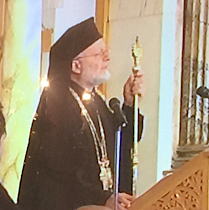 The remarks of newly enthroned Metropolitan Joseph at his enthronement where he lays out his pastoral vision of a shepherd and his staff. Listen to his remarks below but click on the image to see other audio associated with the enthronement. While in the United States for the enthronement of Metropolitan Joseph, the Patriarch of Antioch, His Beatitude John as well as Metropolitan Joseph sat down with Ancient Faith Radio for conversations about a wide range of subjects including Syria, the Assembly of Bishops, Evangelism, and the future vision for the Antiochian Orthodox Church in North America. On a new "The Opinionated Tailor," Kh. Krista West discusses her complicated relationship with her late father, which became less so as she helped him negotiate the end of his life. Kh. Krista is the author of The Garments of Salvation: Orthodox Christian Liturgical Vesture, published by St. Vladimir's Seminary Press. Archpriest Chad Hatfield interviews Fr. Lawrence Farley, author of the new St. Vladimir's Seminary Press book Feminism and Tradition: Quiet Reflections on Ordination and Communion, about deaconesses and the true extent of their role in Orthodox Church history. Enter discount code FT20 during checkout to receive a 20% discount on Fr. Farley's book. Fr. Thomas Hopko takes one last look at the phrase "Relax, God is in Control" and provides information on additional material he has written and spoke about regarding this general topic.